CoStar Group Inc (NASDAQ:CSGP) has experienced a decrease in support from the world’s most elite money managers in recent months. Our calculations also showed that CSGP isn’t among the 30 most popular stocks among hedge funds. In the 21st century investor’s toolkit there are several formulas market participants use to evaluate stocks. A couple of the less known formulas are hedge fund and insider trading signals. Our experts have shown that, historically, those who follow the top picks of the best money managers can outpace their index-focused peers by a superb margin (see the details here). Let’s go over the fresh hedge fund action surrounding CoStar Group Inc (NASDAQ:CSGP). 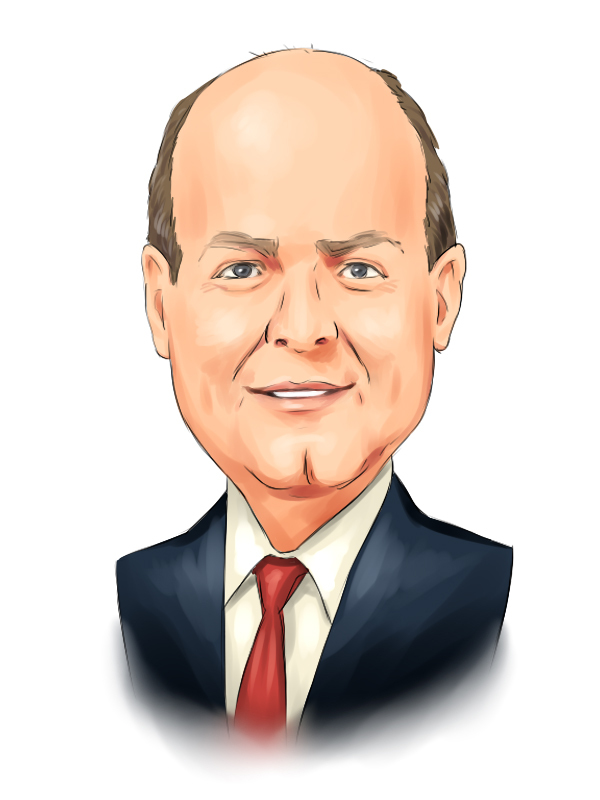 What have hedge funds been doing with CoStar Group Inc (NASDAQ:CSGP)? At the end of the fourth quarter, a total of 23 of the hedge funds tracked by Insider Monkey held long positions in this stock, a change of -21% from the second quarter of 2018. Below, you can check out the change in hedge fund sentiment towards CSGP over the last 14 quarters. With hedgies’ positions undergoing their usual ebb and flow, there exists a select group of key hedge fund managers who were increasing their holdings substantially (or already accumulated large positions). The largest stake in CoStar Group Inc (NASDAQ:CSGP) was held by Bares Capital Management, which reported holding $199.5 million worth of stock at the end of September. It was followed by Select Equity Group with a $188.7 million position. Other investors bullish on the company included Balyasny Asset Management, Wildcat Capital Management, and Citadel Investment Group. Seeing as CoStar Group Inc (NASDAQ:CSGP) has faced falling interest from the smart money, it’s easy to see that there were a few fund managers that slashed their entire stakes heading into Q3. It’s worth mentioning that Paul Reeder and Edward Shapiro’s PAR Capital Management sold off the largest position of the 700 funds monitored by Insider Monkey, comprising an estimated $48.4 million in stock, and James Crichton’s Hitchwood Capital Management was right behind this move, as the fund sold off about $27.4 million worth. These bearish behaviors are important to note, as total hedge fund interest dropped by 6 funds heading into Q3. Let’s go over hedge fund activity in other stocks – not necessarily in the same industry as CoStar Group Inc (NASDAQ:CSGP) but similarly valued. These stocks are Cadence Design Systems Inc (NASDAQ:CDNS), Teck Resources Ltd (NYSE:TECK), CDW Corporation (NASDAQ:CDW), and The Liberty SiriusXM Group (NASDAQ:LSXMK). This group of stocks’ market caps resemble CSGP’s market cap. As you can see these stocks had an average of 31.5 hedge funds with bullish positions and the average amount invested in these stocks was $1436 million. That figure was $754 million in CSGP’s case. The Liberty SiriusXM Group (NASDAQ:LSXMK) is the most popular stock in this table. On the other hand Teck Resources Ltd (NYSE:TECK) is the least popular one with only 26 bullish hedge fund positions. Compared to these stocks CoStar Group Inc (NASDAQ:CSGP) is even less popular than TECK. 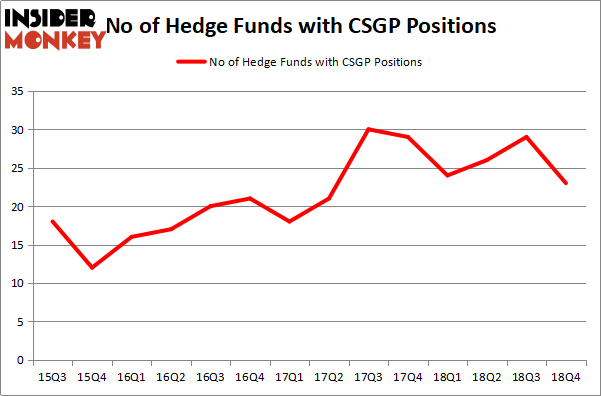 Clearly hedge funds dropped the ball on CSGP and sold it at the wrong time. Our calculations showed that top 15 most popular stocks among hedge funds returned 19.7% through March 15th and outperformed the S&P 500 ETF (SPY) by 6.6 percentage points. Only a few hedge funds were right about betting on CSGP as the stock returned 39.1% and outperformed the market as well. You can see the entire list of these shrewd hedge funds here. Were Hedge Funds Right About Souring On Vornado Realty Trust (VNO)? Hedge Funds Haven’t Been This Bullish On DexCom, Inc. (DXCM) Since 2015... Were Hedge Funds Right About Flocking Into Marvell Technology Group (MRVL)? Is Seagate Technology (STX) A Good Stock To Buy? Were Hedge Funds Right About Dumping Elanco Animal Health Incorporated (ELAN... Do Hedge Funds Love Lincoln National Corporation (LNC)?